Every now and again something extraordinary happens. We were out birding yesterday on St Mary’s on the Isles of Scilly prior to me catching the Scillonian back to the mainland. We were in Carreg Dhu, an ornamental garden in the middle of the island when a big flock of …. hawfinches flew into the sycamore tree directly above our heads. It was difficult counting them as the foliage obscured them and they came in two groups separated by around 30 seconds. We made an estimate of 24 + birds. 24 +!! 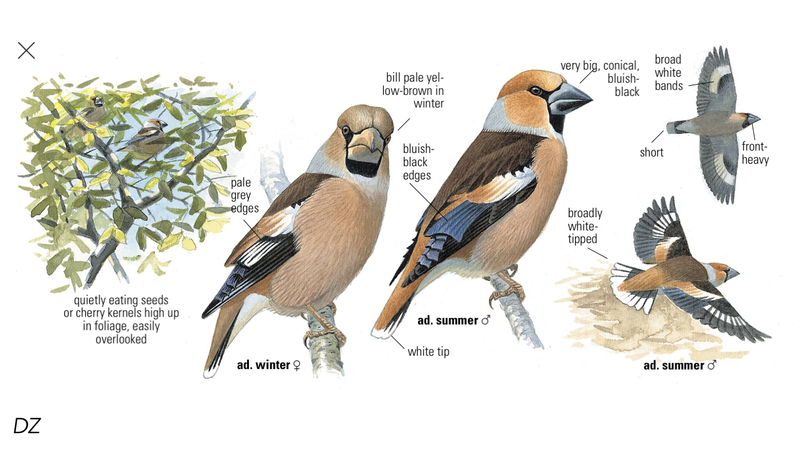 This illustration is from the Collins Bird Guide app – the broad white bands on the underwings were very obvious as were the white tail feathers. By the way the Collins Bird Guide app is highly recommended, it works brilliantly on an iPhone (see here) and there is also an Android version too. A little later the flock was spotted again by other birders and it was estimated that there were between 50-60 birds in it. By all accounts there were also some flocks of hawfinches on the mainland too. I doubt very much whether I will every see such a thing again. The UK is currently experiencing some big southerlies so the most likely explanation is that these flocks have come from the Continent. Here is a photo of a couple of the birds from wildlife photographer, Richard Stonier’s twitter account. You can checkout his gallery of hawfinch photos here. 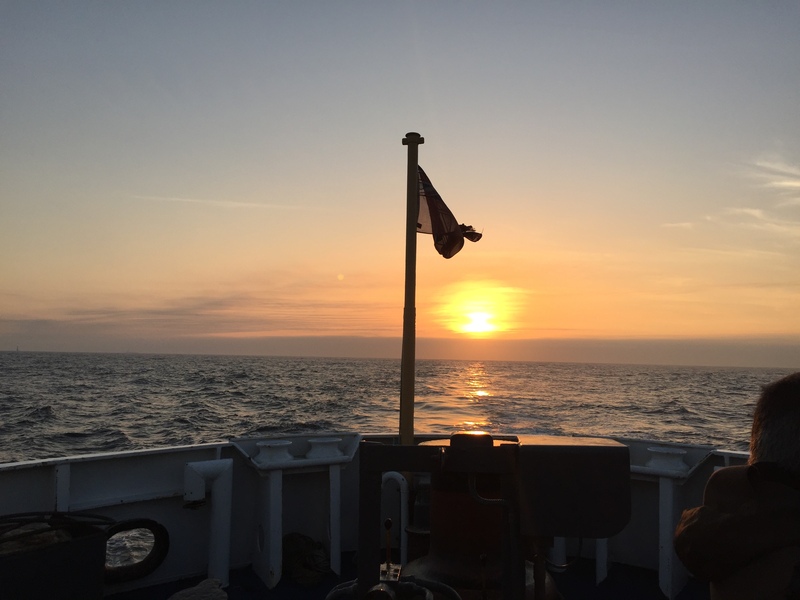 Even got a great sunset over the Isles of Scilly on the way back to Penzance. 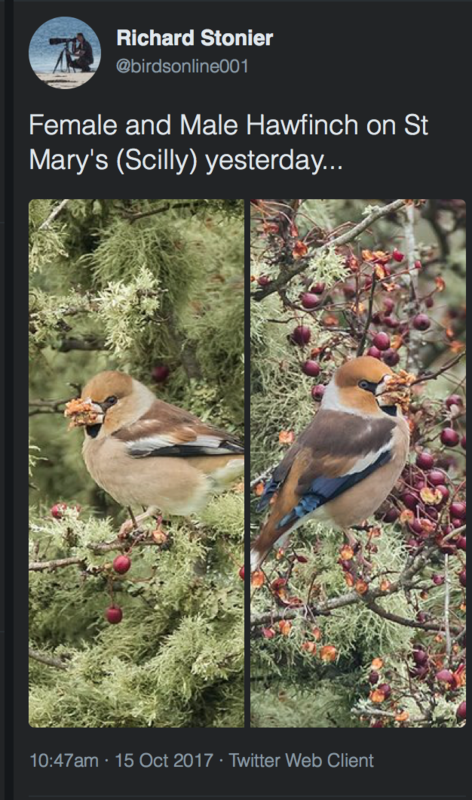 This entry was posted in Isles of Scilly and tagged Hawfinches, Isles of Scilly, St Marys. Bookmark the permalink. And I’ve never seen one! Such a beautiful bird. Green with envy.